Here are some snazzy birthday facts about 26th of March 1944 that no one tells you about. Don’t wait a minute longer and jump in using the content links below. Average read time of 9 minutes. Enjoy! What day was my birthday Mar 26, 1944? March 26, 1944 was a Sunday and it was the 86th day of the year 1944. It was the 13th Sunday of that year. The next time you can reuse your old 1944 calendar will be in 2028. Both calendars will be exactly the same! This is assuming you are not interested in the dates for Easter and other irregular holidays that are based on a lunisolar calendar. What day was March 26 this year? There are 343 days left before your next birthday. You will be 76 years old when that day comes. There have been 27,416 days from the day you were born up to today. If you’ve been sleeping 8 hours daily since birth, then you have slept a total of 9,139 days or 25.02 years. You spent 33% of your life sleeping. Since night and day always follow each other, there were precisely 928 full moons after you were born up to this day. How many of them did you see? The next full moon that you can see will be on April 19 at 11:14:00 GMT – Friday. Fun stat: Your first one billion seconds (1,000,000,000) happened sometime on December 3, 1975. If a dog named Stritch - a Swedish Vallhund breed, was born on the same date as you then it will be 357 dog years old today. A dog’s first human year is equal to 15 dog years. Dogs age differently depending on breed and size. When you reach the age of 6 Stritch will be 42 dog years old. From that point forward a medium-sized dog like Stritch will age 4.5 dog years for every human year. View the complete list of March 26 celebrity birthdays. Who are the famous March 26 birthdays? Here’s a short list of famous people in history who were born on Mar 26. View the complete list of March 26 famous birthdays. What happened on my birthday – Mar 26th? Emperor Maurice proclaims his son Theodosius as co-emperor of the Byzantine Empire. Pope John XIX crowns Conrad II as Holy Roman Emperor. The Siege of Algeciras, one of the first European military engagements where gunpowder was used, comes to an end. Combat of the Thirty : Thirty Breton Knights call out and defeat thirty English Knights. William Caxton prints his translation of Aesop’s Fables. Ice hockey: The Vancouver Millionaires sweep the Ottawa Senators three-games-to-none to win the 1915 Stanley Cup Finals, the first championship played between the Pacific Coast Hockey Association and the National Hockey Association. Spanish Civil War: Nationalists begin their final offensive of the war. World War II: The Battle of Iwo Jima ends as the island is officially secured by American forces. View the complete list of March 26 historical events. Curious about this Empyrean Delight? This is a party item you can activate and send to your friends when you play the free game Jump Birthday Party. It’s a fun and easy-to-play mobile game for all ages. Get free 1,000 gold coins when you download today! What does my birthday March 26, 1944 mean? Your birthday numbers 3, 26, and 1944 reveal that your Life Path number is 2. It represents balance, harmony and partnership. You have the soul of an artist. You are a fine companion and possess a good sense of humor. Friends seek you out for your calming and peaceful company. The following celebrities also have the same life path number: Jessica Hahn, Dorothea Jordan, Tiny Bradshaw, Hazel Scott, Kendall Jenner, Chen Hao, Slim Dunlap, Taryn Southern, S. Epatha Merkerson, Tom Krause. 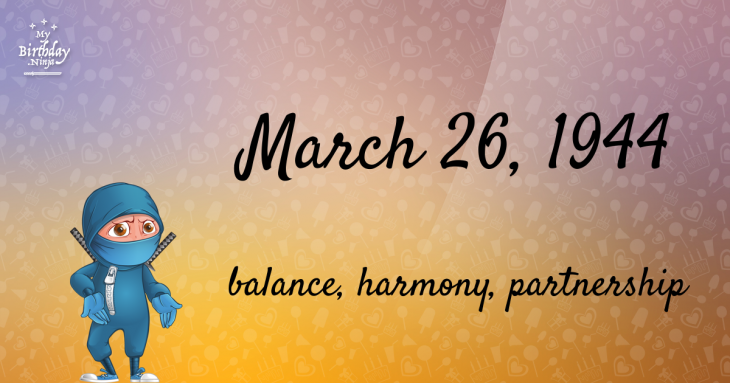 What is the birthday horoscope for Mar 26, 1944? The Western zodiac or sun sign of a person born on March 26 is Aries ♈ (The Ram) – a cardinal sign with Fire as Western element. The ruling planet is Mars – the planet of war and ambition. According to the ancient art of Chinese astrology (or Eastern zodiac), Monkey is the mythical animal and Wood is the Eastern element of a person born on March 26, 1944. What is the birthstone for March 26? Aquamarine is the modern birthstone for the month of March while Jade is the mystical birth stone (based on Tibetan origin). The zodiac gemstone for Aries is bloodstone. Lastly, the birthday stone for the day of the week ‘Sunday’ is topaz. Fun fact: The birth flower for 26th March 1944 is Jonquil for affection. What is the Love Match for Mar 26, 1944? When it comes to love and relationship, you are most compatible with a person born on August 5, 1955. You have a Love Match compatibility score of +120. Imagine being in love with your soul mate. On the negative side, you are most incompatible with a person born on December 23, 1967. Your incompatibility score is -129. You’ll be like a cat and a dog on a love-hate relationship. Arf-arf, I want to bite you. Meow-meow, stay away from me! What is a good birthday trivia for March 26? What is the popular baby name on 26 Mar 1944? What’s your bizarre Florida Man story? The #FloridaManChallenge is breaking the Internet and social media. Some crazy men, women, or creatures from the Sunshine State are making headlines every day of the year including your birthday. Try this fun exercise. Pick your search engine of choice and type in “florida man March 26” and see what kind of wild news headline you will get. This viral craze started in 2013 and gets resurrected now and then. The latest was from Tumblr and found its way to Twitter. As they say, the rest is history. Here’s a quick list of all the fun birthday facts about March 26, 1944. Celebrities, famous birthdays, historical events, and past life were excluded. 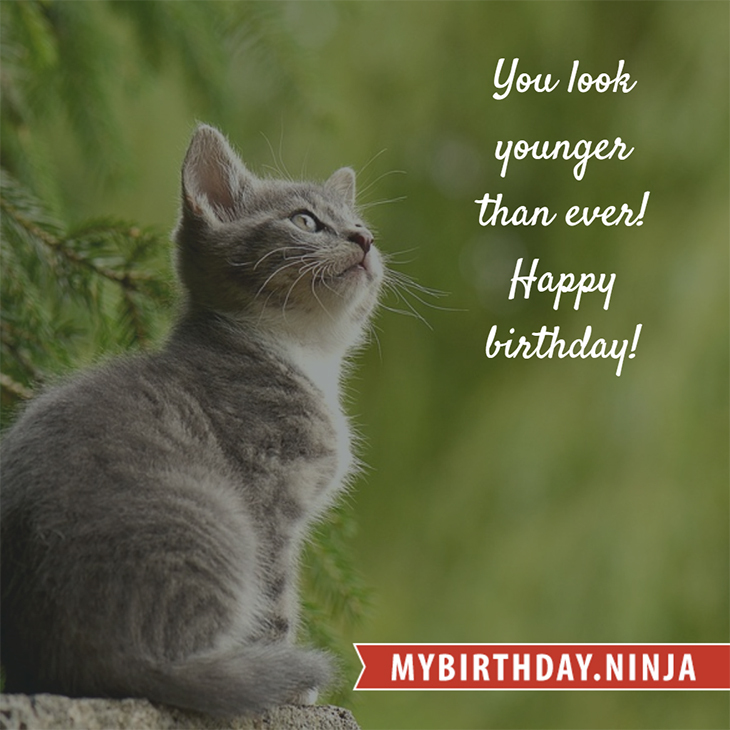 Try another birth date of someone you know or try the birthday of these celebrities: March 31, 1984 – Yanin Vismitananda, Thai actress and martial artist; May 24, 1952 – Sybil Danning, Austrian actress and producer; June 4, 1991 – Megan Prescott, English actress.